InfusionSoft is a complete sales and marketing automation software suite to help small businesses make their sales and marketing process simple. With its powerful features of CRM, Email and Social Marketing, it helps businesses streamline their processes, create targeted campaigns and boost sales. InfusionSoft is used by thousands of small businesses around the globe. Deploying our Live Chat solution with InfusionSoft helps you deepen your relationships with the customers in many ways. ProProfs Chat brings together everything you need into a Live Chat solution to provide excellent customer service. With Infusionsoft ProProfs integration, chat transcript will be posted to your infusion soft account at the end of every chat session. How to integrate ProProfs Chat with InfusionSoft? We have made the integration process of ProProfs Chat with different CRMs and other applications are totally hassle-free and quick. It takes not more than 10 minutes to enjoy live chat facility into your InfusionSoft system. To get started. For this, Following details are required. First, you need to log in your InfusionSoft account for above details. Get Application Name: Your InfusionSoft account denotes your application name. For example, if your Infusion soft URL is: myapp.infusionsoft.com, then “myapp” is your Application Name. After getting the API key, You need to create action ID to assign the chats to users. 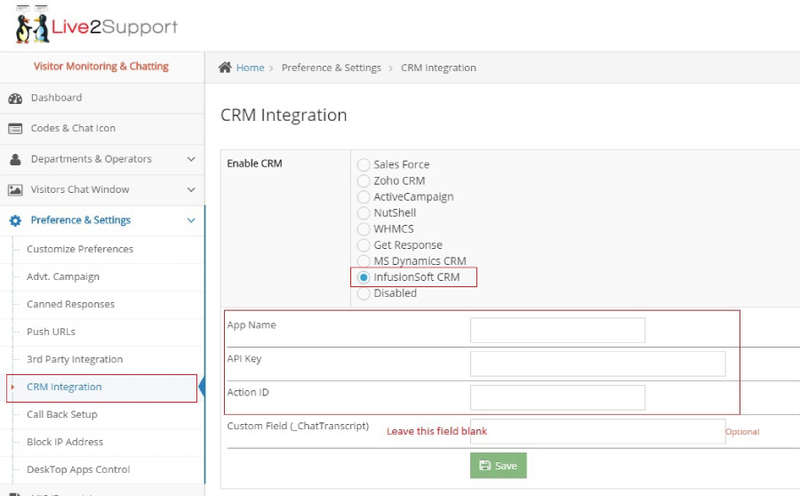 For this, You need to go CRM section settings (See following screen). Now click on Action “Action Set” to create the new action for Chat transcripts. Once you save the details, InfusionSoft Integration is done. Now Do the test chat and close it. You will see the chat transcript in contact (Search with email) in “Notes” Section of that contact.